The Best Extra, Extra Wide Fit Women's Slippers with adjustable closures accommodate even the most swollen feet and swollen ankles in fabulous comfort. Order your exact size to ensure proper fit - Do not go up a size to accommodate width or swelling. A great choice for elderly with bunions, corns, hammer toes, foot edema, diabetes and podiatry foot problems. 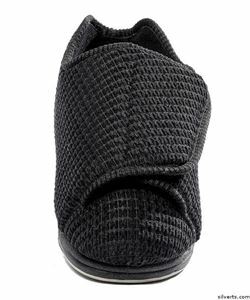 The wide width slipper opening features a hook and loop fastener. Skid-resistant non slip slipper soles. Memory foam insoles for the ultimate in comfort! Anti-bacterial to control odor and stains. This slipper has been worn as a shoe. Terrific for those with arthritis or lowered hand dexterity. These adjustable wide width slippers make the best diabetic slipper for women. Extra-roomy deep WW wide width slippers for swollen feet and ankles are great for patients in hospitals, post surgery, nursing home patients residents and retirement homes. These Extra Wide Width Women's Bedroom or House Slippers by Silvert are perfect for comfortable casual use in the home and for home care settings.